Sam’s Club is a part of the Walmart group of businesses. It is a warehouse-style store that sells to members only. Products are chosen with businesses and private consumers in mind. Like most warehouse-style stores, merchandise is sold in bulk and multi-packs, either right from the shipping pallet or stocked on industrial-type, steel shelving. The average store size is 133,000 square feet. Foodstuffs at Sam’s Club include canned food, cereal, beverages, snacks, candy, personal hygiene products, fresh and frozen meats, deli-style meats and cheeses, ready to eat products, cleaning and paper products. In addition, most stores include a bakery and café. Aside from grocery items, Sam’s Club also carries jewelry, designer clothing, electronics, small appliances and collectibles. Most locations also include Tire and Battery, Photo, Optical and pharmacy departments. Some locations have gas stations, as well. There are Sam’s Clubs located in every state in the U.S. other than Vermont and Oregon. As with most grocery sellers today, Sam’s Club offers private label products. These markets offer Member’s Mark, Bakers & Chefs and Sam’s Club. They also feature private label manufacturer products from Richelieu Foods in the form of salad dressing, marinades, condiments, deli salads and frozen pizza. A popular feature held at most locations is Shopper Events. Shopper Events employees are set up with stands throughout the warehouse and prepare food products that give members a chance to sample products prior to purchasing. Estimates put membership at around 47 million U.S. members. Sam’s Club also operates more than 100 locations internationally in Puerto Rico, Brazil, China, and Mexico. There are approximately 121 international locations. Total sales for Sam’s Club stand at $46.7 billion, and $31.3 billion are food sale related (67%). Sam’s Club memberships are available in three categories: Plus, Advantage, and Business. Membership can be purchased at the service desk, any cash register and some locations offer an ATM/Membership kiosk. 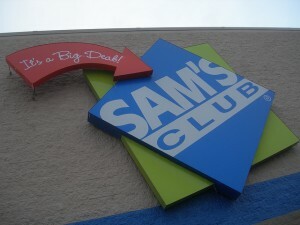 Sam’s Club carries 4.2% and sixth place in the grocery market scene as of December 2010 (the most recent data available). They continue to stay behind Costco in popularity and sales volume. Sam’s Club is named after the founder of Walmart, Sam Walton.